Academy of Children’s Theatre offers camp, classes and programs for kids of all ages in the summer. Our camps run Monday-Friday and have a new theme each week! From Princesses to Star Wars and Harry Potter to Musical Theatre there’s something for every kid! Each camp ends in a sharing day! Students will learn about unarmed and armed drill, color guard and physical fitness. This camp is being offered as part of Kennewick School District’s Summer Camp Program. All American Gymnastics is offering two gymnastic camps (June 18-21 and July 16-19) and two cheer camps (July 9-12 and July 23-26) for ages 6 and older. Allied Arts Association is offering a variety of children’s summer art workshops for ages 7-15. Workshops begin June 18 and end August 17. The Boys & Girls Club is offering summer camps at two locations in Pasco. Their activities are designed for fun as well as to aid in the prevention of summer learning loss. Each week is a new adventure centered around a theme. The camp runs from June 14 – August 24. Call (509) 543-9980 for more information. Locations: Main Branch, 801 N 18th Ave & Maya Angelou Elementary, 6001 Rd 84 – both in Pasco. Summer Day Camps at the Music and Arts Center are designed to give your child an in depth look at a variety of subjects including technology, music, art and healthy living. The camp runs from June 18 – August 24. Call (509) 582-4090 for more information. Legacy Jiu-Jitsu in Richland is offering two summer camps July 16-20 and August 13-17 designed for kids, ages 7-13, of all skill levels to learn how to defend for themselves. Each camp runs Monday-Friday from 9 a.m. – Noon. The fee is $150 for non-members and $130 for members. Your child will not want to miss out on the chance to imagine, tinker and invent prototypes that they can take home with them this summer! The Illuminate curriculum features four energetic and fun-filled modules that incorporate Science, Technology, Engineering and Math (STEM) activities. This camp will be held July 16-20 at Mid-Columbia Partnership and is for those entering grades K-6. The Trios Diabetes Education Department and Trios Foundation is offering a 3-day camp for kids who have been diagnosed with Type-1 diabetes. The camp is available for children ages 6 to 14. At camp, participants have the opportunity to build relationships with peers with similar health situations, learn how to manage their diabetes, and interact closely with mentors and volunteers who can relate to their experiences and offer advice – all while having fun. They’re also looking for teens ages 15-18 with Type 1 diabetes to help mentor younger children. Create your game app on android phones and tablets. No experience needed, we will teach you. Make friends and a game in our fun and exciting computer lab. – Summer Girl coding camp (middle school age), July 9–12 from 9 a.m. to 4 p.m.
– Summer Boy coding camp (middle school age), July 16-19 from 9 a.m. to 4 p.m.
Email jbee@columbiabasin.edu or call 509.542.4892 to request a registration packet which is due June 30. Health and fitness for 5-13 years old! Kid’s Club Campers will have fun participating in a variety of activities while learning sportsmanship, leadership, and teamwork! Camp activities include: Pelican Bay, guest speakers, gym games, rockwall climbing, racquetball, arts and crafts, and more! Summer camp begins June 13. 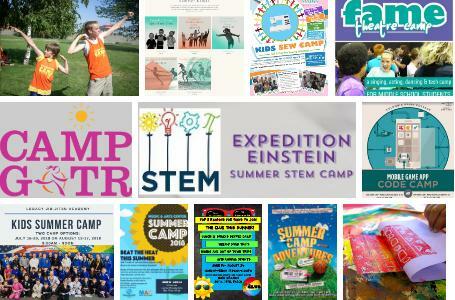 Expedition Einstein is a one week summer STEM camp for all elementary students (for the 2017-18 school year). Throughout the week, campers will have the opportunity to learn about STEM, conduct a variety of safe, fun experiments, and make new friends! Expedition Einstein is offered in two sessions, both one week each. Session 1 is July 9-13 at the Richland Public Library from 9:30am-12:30pm. Session 2 is July 23-27 at the Richland Public Library from 9:30am-12:30pm. Expedition Einstein is completely Free! Thanks to last year’s success, we were able to obtain sponsorship support from Kiwanis International. Registration form must be completed and sent in by June 25 for Session 1 or July 9 for Session 2. Students will learn French vocabulary from a popular fairy tale and then make language connections in the brain by acting out the story in mime. Students will perform the story on the last day. This class is a collaboration between ACT, Bon Voyage French School and Big Top Entertainment. Throughout the week, girls will have fun exploring friendships with activities designed to discover what makes a good friend and how to be a good friend to others. Girls will build, create, write, discuss, connect, and laugh all while participating in games and activities that will leave them feeling confident and appreciated by their teammates. A singing, acting, dancing and tech day camp for middle school students (entering grades 7-9). Campers will interact one-on-one with both adults and older students, all of whom bring diverse experience and interests to the FAME program. The camp runs July 16-28, Monday – Friday from 12:45 p.m. – 5 p.m. Learn to ride & care for horses during one of the five 5-day sessions for ages 5-17 being offered throughout the summer. The Summer Enrichment program is an opportunity for students, K – 5th Grade, to continue engaging in educational opportunities throughout the summer. Summer Enrichment provides academic instruction, themed activities, events and field trips. The program begins June 25 and ends August 15. Kingspoint Christian School is located at 7900 West Court Street in Pasco. Cost: $250 registration and curriculum, $1000 tuition and activities. Imagine singing all morning for a week this summer! Mid-Columbia Mastersingers is pleased to be hosting the 4th annual Summer Camp. Open to boys and girls entering grades 4 through 7. Camp is Tue-Fri, Aug 14-17, from 8:30 am – 11:00 am. On Saturday, August 18, the students will sing the national anthem and attend the Dust Devils baseball game! The annual reading and spelling camp in Richland will teach participants penmanship, reading and comprehension skills, spelling rules and grammar. The camp runs June 18 – July 19, Monday-Friday, 8:15 a.m – 12:00 p.m. and is for students 2nd grade and up. There is no camp on July 4-6. Cost: $400. This program will help students catch up if they are behind in school. If they are gifted students, it will help them become even more accelerated learners. Instructors teach English phonics, grammar, spelling rules and penmanship. Students will learn about homonyms, homographs, homophones, sentence structure and much more in 60 hours of instruction over a 20-day period. For best results, it is recommended that a parent, grandparent or supportive family member attend for free with the paying student. Two summer sewing camp for children ages 9-15 will be offered. Session 1 is July 30 – August 2 and Session 2 is August 6-9. No experience is necessary! During class kids will learn sewing basics, safety, and how to operate a sewing machine while completing 3 fun projects. From 9 a.m. – 4 p.m.
For kids ages 6-10. This day camp will give them the skills and confidence to get around town with Ben Franklin Transit. We’ll start at the REACH Museum at 9:00 a.m., learn how to use Google Maps and BFT’s My Ride app to plan a trip, and ride the River Runner route to the Playground of Dreams for a picnic lunch. Then it’s on to the Carousel Of Dreams via Three Rivers Transit Center. Please register by Friday, June 15. Kids will have a blast with the REACH hiking Twin Sisters, visiting the SAGE Center, and having an ice cream social! Drop-off and Pick-up will be at the REACH Museum. Remember to pack your own lunch. Know any budding scientists? Are your kids eager to know more about Lepidoptera? Sign them up for Junior Entomology Camp! They will learn all about butterflies, moths, arthropods, aquatic invertebrates, and how to start their own collection. This special summer camp is for kids ages 7-10 only. Remember to pack your own lunch! Kids will have a blast with the REACH visiting the Central Washington Agriculture Museum and Yakima Arboretum. Drop-off and Pick-up will be at the REACH Museum. Remember to pack your own lunch. We will be traveling down to Pendleton, Oregon to tour the Blue Mountain Wildlife Refuge, where they house and help rehabilitate native birds. Next we will visit the Tamastslikt Cultural Center to learn about local tribes. Drop-off and Pick-up will be at the REACH Museum. Remember to pack your own lunch. To register for any of these camps, please contact Laura at (509) 943-4100 ext. 107 or Pauline at paulines@visitthereach.org. Open to families with children in grade K-6. There will be lessons and time to practice your skills playing against other members of the group. Find us in the Richland Library. This is a six Wednesday program that begins June 13 (skipping July 4th) through July 25. The group will meet between 6:30 p.m. and 8 p.m. Please register by emailing: Subject: “Summer Chess Nights” to weccboard@chesschampions.org. Synergy Dance Project in Kennewick is offering six 3-day mini dance day camps for ages 3-7. Each camp is based on a different theme. The first camp begins June 26 and the last camp begins August 7. – PNP Junior – ages 2-7 – The camp is offered weekly for 3 weeks: July 16, July 23 and July 30. You can attend 1 week or all 3 weeks. If your child is in grades 4-12, we invite them to join us for some musical fun. TCSBA offers steel drum and marimba classes for children. Our classes teach music fundamentals in a fun, creative and energetic environment. Thrive Creative Dance camps were created for students to be inspired, have fun, and keep their minds and bodies active over the summer. We have options for kids from 18 months to 17 years, with all skill levels welcome! Each camp is 4 days long and meets at Howard Amon Park or the Richland Community Center. Tri-City Court Club offers two camps: one for ages 6-9 and another for ages 10-13. Kids participate in a variety of activities that include a roller rink, movie theater, miniature golf, rock climbing, bowling, and the SplashDown Cove Water Park. Camp is daily, Monday through Friday from 7:30 a.m. – 5:15 p.m. and runs from June 18 through August 24. White Bluffs Quilt Museum will be teaching a variety of children’s textile art programs. Join us as we learn to sew, quilt, weave, knit, work with wood and create unique jewelry. Class projects will be on display at the White Bluffs Quilt Museum. Washington State University Tri-Cities offers several different, hands-on camps to challenge and engage students this summer. Space is limited so sign up now. Elementary School: Four different day camps are specifically designed for students who are entering 4th & 5th grades and are held in Richland from 8:30 a.m. to 4:30 p.m., Monday through Friday. Middle School: Seven different day camps are specifically designed for students who are entering 6th, 7th & 8th grades and are held in Richland from 8:30 a.m. to 4:30 p.m., Monday through Friday. Summer is a blast with YMCA Camps! We offer a variety of unique programs for kids ages 5-12; there’s something for everyone! Camp Plus+, Discovery Camp and Explorer Camp will follow the same weekly themes with activities that are specially designed for each age group. Richland Lacrosse Youth Camp – For boys and girls grades K-8. Perfect for the already experienced player or if you are just wanting to give lacrosse a try for the first time. Camp will include skill and position development, games, scrimmages and loads of fun! Find out why lacrosse is the fastest growing sport in the country! June 25, 26, and 27th from 9 a.m. to noon at Badger Mountain Park in Richland. Cost is $75 which includes a t-shirt if registered by June 15th. Don’t forget to check out the activities available from the City Parks and Recreation Departments! Ben Franklin Transit is selling summer youth passes for $25 which are good for unlimited boardings during June, July, and August. They are available to youth up to 18 years of age or through high school. New this year: Try the new River Runner! A seasonal route with hourly trips through Columbia Park from June through August. This blog post was published by Jim McIntyre who maintains this Tri-Cities Events & Things to Do blog as a hobby as part of his Tri-Cities Washington Guide website. This blog is not associated with any business or organization and is focused on community events and things to do around the Tri-Cities region with an emphasis on annual community events and events associated with non-profit organizations and/or charitable causes. Both images and trademarks are copyrighted by their respective copyright holders. The author does publish images that were obtained from the sources for which information is provided. If you see an image that belongs to you and want credit for it or want the image removed or a different one used, please contact the author at webmaster@tri-citiesguide.org. The author does not endorse any products, services and activities – all references are provided for informational purposes, only. Please do not contact the author about commercial postings, promotions or advertising. The author encourages the sharing of content from this blog post for non-commercial purposes and that includes the RSS feed. Please give credit to the author for any content that you share. Any link to this blog post to promote the sale of goods, services or causes is not permitted. The author is also not interested in any link exchanges or posting “sponsored content” from outside sources. Feedback is encouraged, especially to point out errors and omissions. Feel free to contact the author at webmaster@tri-citiesguide.org. You will receive an email from Feedburner to confirm your subscription. Your email address will not be shared.